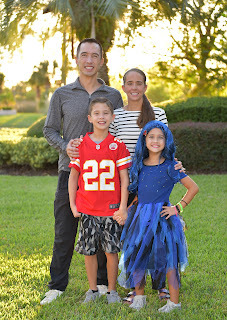 On Wednesday we celebrated Halloween for 2018 in the neighborhood. Paige was excited to dress up as "Evie" (from the Descendents) and looked transformed with her blue dress and long blue wig. Connor didn't really want to trick-or-treat, but reluctantly threw on a Chief's Jersey and went along with us. Grandma and Grandpa came over and we set out around 6pm on the golf cart after snapping a few pics. It was a beautiful day and the weather cooperated as well as we could have hoped for. Andrea did a nice job driving us around in the golf cart and we went to some of the houses near ours and then to Lamplighter and Found Forest. We stayed out past dark and then decided to get home around 8 so we would have time to unwind and hand out some candy too.